Laine Edwards with her piece, “Keep Fighting,” which won the People’s Choice Award. Art is a statement of the human spirit. For 39 years the Frank Stick Memorial Art Show has championed that belief, and the 2017 version of the longest running art show on the Outer Banks is carrying on that tradition with unmistakable passion and commitment. Held at the Dare County Arts Council Gallery in the Old Dare County Courthouse, the reception for the show was last Saturday evening. For the previous 32 years, the show was held at Glenn Eure’s Ghost Fleet Gallery, and Glenn and his wife, Pat, were on hand for the opening ceremonies. Glenn, normally loquacious, was a bit under the weather with laryngitis, and Pat took over speaking duties for him. She also talked about the role art displayed in past shows has played in our community. The 2017 version was no different, although no one was threatening to close the show. 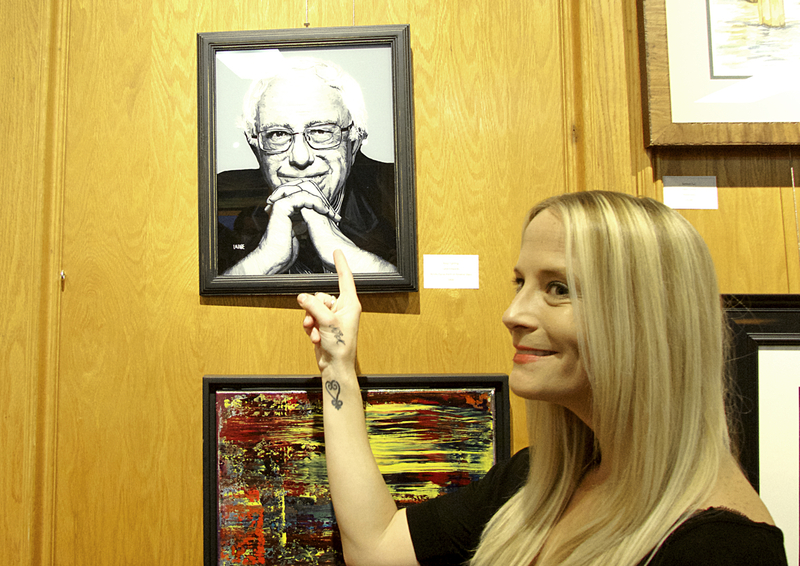 Laine Edwards’ piece, Keep Fighting, which was created with acrylic and spray paint on a reverse glass portrait of Bernie Sanders was voted the People’s Choice Award. “It was a resounding win for Laine Edwards,” said DCAC Programs Director Fay Edwards as she described the voting. The piece is a personal statement for Laine, one that speaks to the character of Sanders. This is the third year in a row that Laine has won the People’s Choice Award. Not every piece at the show was controversial; as is usually the case, most were not. The quality of the works were, however, outstanding. 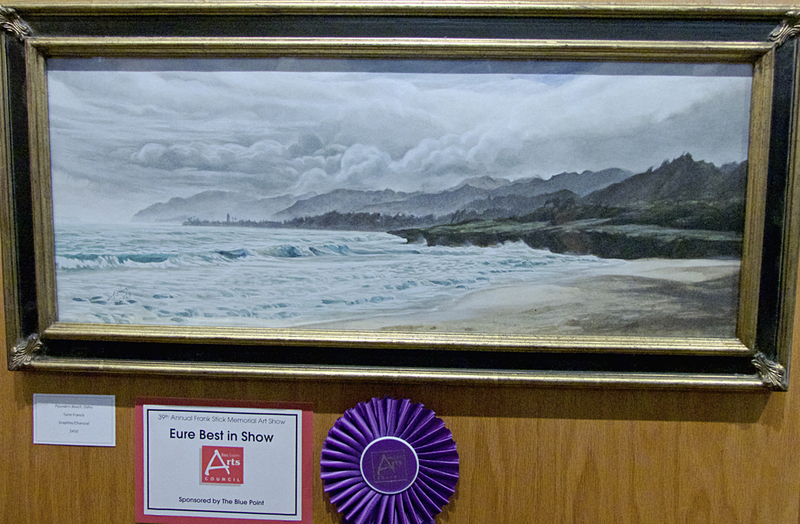 2017 Eure Best in Show “Pounders Beach, Oahu.” Graphite and charcoal by Torin Francis. As a tribute to Glenn and Pat Eure’s years of contributions, the Best in Show award was renamed the Eure Best in Show award, and the winner this year was Torin Francis. Torin splits his time between Kitty Hawk, where he grew up, and Hawaii, and his winning entry, Pounder’s Beach, Oahu, was a wonderfully subtle and beautiful depiction of a tropical beach. Although the Frank Stick Memorial Show is almost 40 years old, the gallery was very well represented by the under-40 set, a point Pat made in her opening remarks. Travis Fowler’s untitled brass leaf on a wood panel. “Many of you were not born yet,” she said as she talked about the first show. Although young, the quality of the work demonstrated by the artists showed a powerful creative force. Travis Fowler’s untitled brass leaf on a wood panel, awarded a ribbon of excellence, was a very good example of the skill that a new wave of Outer Banks artists are bringing to the show. Set on a curved wood backing—he described the curve as the curve of a skateboard—there is a pattern that runs through the leaf. That pattern, according to Fowler, is the palm of a hand. Some longer-established artists were also on hand and bringing home ribbons. Best in Show—that’s the name of the piece, not the award—received a excellence recognition for Brad Price. The piece began, according to Brad, as a painting at one of the workshops he offers at his Hang 12 Studio in Kill Devil Hills. 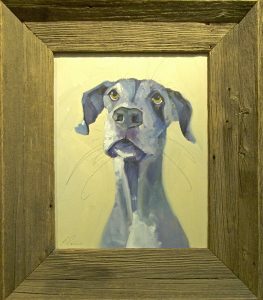 The 39th Annual Frank Stick Memorial Art Show will be on display at the Dare County Arts Council Gallery through February 25.